We all buy cheap tools now and then when we know we are only going to use them once or twice to complete a job and then throw them in the tool chest for the next decade without ever touching them. This is perhaps one of the few excuses a car mechanic has to justify buying inexpensive tools. However, these are usually simple hand tools with few moving parts. The stakes are a little higher when buying calibrated tools, such as a torque wrench, particularly when you must rely on them for your safety. Fortunately, Tekton has rapidly been emerging as the go-to company for inexpensive tools, including tools with moving parts that require some precision. Tekton’s tools are typically aimed downmarket at the value oriented crowd, but that certainly doesn’t mean that they aren’t of decent quality. 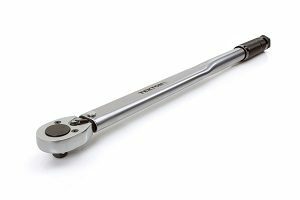 We decided to give Tekton’s 24340 1/2″ Drive Click Torque Wrench a try to see how it compared to some of the more expensive brands. When it comes to features, we were pleasantly surprised to see that Tekton outfitted this wrench pretty well. It boasts a torque range of 25-250 ft-lbs, which converts to 33.9-339.0 N-m for our friends who think in metric units. This range is sufficient to cover most larger projects on cars or trucks, including tightening lug bolts, suspension work, and replacing your brakes. The 24340 is calibrated to an accuracy of +/- 4%, which isn’t market leading but falls closer to mid-pack. Nonetheless, 4% is a reasonable tolerance for a torque wrench accuracy rating and is going to be good enough for wrenching on your car. Torque is easily set by rotating the handle, and while we prefer the general feel of CDI’s wrenches, the Tekton still holds its own quite nicely. The scale on the handle is extremely visible (which we actually prefer over CDI’s markings), which we consider to be a very nice touch. Overall length for the wrench is 26 inches with a weight of roughly 6.5 pounds. The country of manufacture is Taiwan, but this fact should not dissuade you from considering the purchase as the quality doesn’t seem to suffer. When arriving at your expected torque value, there is a positive “click” that is audible. The wrench is reversible, which means that you can safely use it to either loosen or tighten bolts so long as you flip the toggle switch to the correct side, however be aware that it only measures torque in the clockwise (tightening) direction. It should be noted that the wrench also comes with a molded plastic carrying case, which protects the wrench and keeps it clean when not in use. Believe it or not, at less than half the price of the comparable CDI wrench, the build quality on this wrench remains pretty damn good. We admit that it’s not quite as nice as the CDI, it most definitely doesn’t feel cheap in any way. The materials, fit, and finish are all good. The body of the wrench, as well as the ratcheting components are made from sturdy steel. The finish on the wrench is almost a semi-gloss in that it is smooth but doesn’t reflect light nearly as intensely as some of the fully polished wrenches on the market do. Sometimes a fully polished wrench can be a little distracting visually, and as such, we actually really dig the Tekton’s finish. When it comes to value, there is no doubt that the Tekton 24340 1/2″ Drive Click Torque Wrench has an attractive looking price tag. Furthermore, the fit and finish are great for the money. The one place you do sacrifice is that you can’t measure torque in the counterclockwise direction with this wrench. In reality, the necessity for this feature comes up pretty infrequently in the automotive world, but we still consider it a nice to have for those rare occasions when you may encounter a torqued bolt threaded with left-hand threads. All in all, despite the missing counterclockwise torque capability, the wrench still offers a nice value for a casual mechanic or for someone who isn’t looking to turn their pocketbook inside out. As far as where to buy, Amazon offers competitive pricing which is typically enough to beat local stores and as such, we recommend you start there. If the Tekton doesn’t quite meet your needs, feel free to browse one of our articles that provides more in depth torque wrench information.